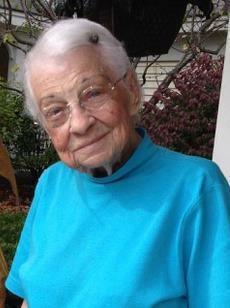 Sara Martenis Townsend died April 1, at age 97. She was predeceased by her husband Ira. They met while students at Middlebury College and were married in Corpus Christi, Texas, in 1943, while Ira was serving in the US Navy as an aviation instructor. After WWII, the couple took up residence in Meriden, where they lived until moving to Harvest Hill in Lebanon in 2010. Sara (known to many as Sally) was born in Putney, Vermont. She graduated from Stevens High School in Claremont. Sara taught French, Spanish and drama at Kimball Union Academy, until retiring from teaching in 1971 to serve as representative from Sullivan County to the state legislature. She was chosen as Republican majority whip and was highly respected by her colleagues in the House for her integrity, insight and sharp wit. She was an advocate for Meals on Wheels, improved care for the elderly, reform of nursing home inspections, and annual car inspections. She was instrumental in passing legislation that led to New Hampshire's first in the nation primary. Drivers on I-89 can see the recreational bike path that runs along the highway, another of her accomplishments. Among the rookies that Sara mentored in the House were Hugh Gallen and Jeanne Shaheen. She and Ira were awarded the Governor's Citation for volunteerism and community involvement by John Lynch. Sara never lost her love of the French language. She continued to enjoy reading French when she wasn't reading the daily newspaper and non-fiction, especially biographies of political leaders. At Harvest Hill, she attended the weekly meetings to discuss current events. As a long-time resident of Meriden, Sara was a founder of the Friends of the Library, and a member of the Congregational Church and the Bird Club associated with the first-in-the-nation Bird Sanctuary. Sara is survived by her daughter Patricia, son Jim and daughter-in-law Sandra, grandchildren Julia and Torrey and Torrey's wife Laura.